Canadian art dealers were in contact with Paul-Émile Borduas even after his departure from Quebec to New York and then to Paris. 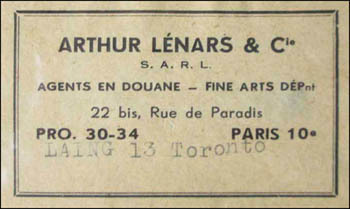 On October 20, 1958, the Toronto gallery owner G. Blair Laing visited Borduas and purchased eight paintings, which were shipped a week later by Arthur Lénars & Cie, the custom agents Borduas dealt with in Paris. Among them was Libellules égarées, which has now resurfaced. 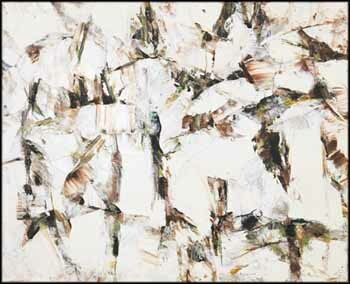 It is noticeable that the paintings acquired by Laing were not the austere Black and White works that Borduas was producing then, but were from his New York period. Borduas wrote to Martha Jackson in New York: “I’ve sold a lot since your last visit to the studio. All I have left are six or seven canvases from New York. A sale of eight paintings this week has got me in a tizzy and obliges me to revise my prices, at least for the New York period...” He even thought that he would stop selling his New York paintings, as he had done with his Automatist period works. As a matter of fact, Blair Laing was the great promoter of Borduas's New York period with the collectors of Toronto. It is not at all surprising then that Libellules égarées, acquired in 1982 by the Mira Godard Gallery, was purchased by a Toronto collector. Even though Libellules égarées is dated circa 1953 - 1954 on the gallery label, I tend to date it at the end of this period rather than at the beginning, because of the strong all-over character of the painting, a style that was still foreign to Borduas when he arrived in New York in 1953. He was confronted for the first time by this “American-type painting,” to quote the words of the great American art critic Clement Greenberg, at the annual exhibition of the Whitney Museum of American Art (October - December 1953), and possibly at the important retrospective of American art at the Metropolitan Museum of Art (December 1953), and maybe even at the Jackson Pollock one-man show at the Sidney Janis Gallery (February 1954). Suddenly, the idea of “objects” suspended in front of a background that receded indefinitely behind them that Borduas had used in his Automatist paintings did not make sense any more. In these works, it was as if the old perspective of space was maintained in non-figurative painting. In his new paintings produced in New York, the “objects” exploded and were reduced to fragments, and the background migrated to the surface of the painting. There was no more “composition” of elements of different size and importance, and no hierarchy between them. There were no accents to attract the eye here rather than there, as in classic European paintings. In this work, the libellules (dragonflies) égarées (strayed) over the whole surface, and this surface had taken on a tactile feel, by getting thicker and showing obvious traces of the painting knife, rather than the smooth strokes of the brush. You could even get the feeling that what was given to you to see could expand out of the canvas area in all directions, as if what you were looking at was just a section of a bigger world. Insects, such as the dragonflies mentioned in the title, could very well express, by their apparently random flight in all directions, this expansion of the scope of the painting, which was no longer confined to the surface of the canvas. When I published my book on Borduas two years ago through McGill-Queen’s University Press, I said that Libellules égarées had “vanished.” Well, I was wrong - it has now shown up, and it is an important and beautiful painting. This work is included in François-Marc Gagnon's online catalogue raisonée on the artist's work at www.borduas.concordia.ca/en/about/index.php, catalogue #2005-0976.